The Italian election and the manufacturing data from the US are the most influential factors for EURUSD. 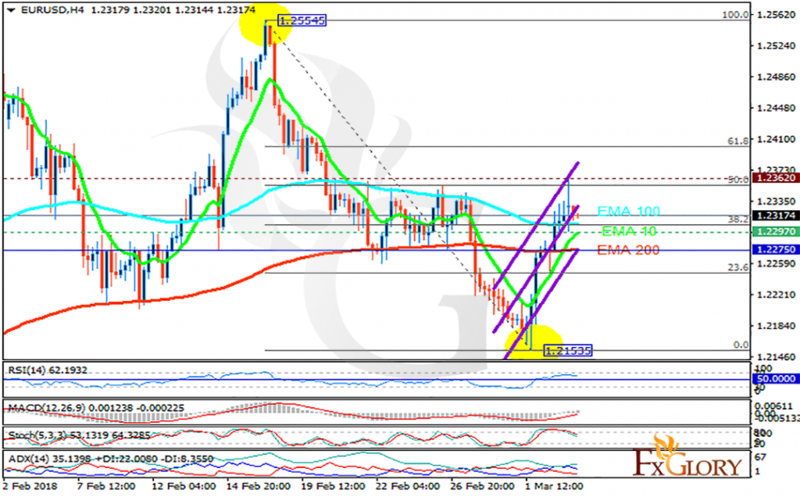 The support rests at 1.22970 with resistance at 1.23620 which both lines are above the weekly pivot point at 1.22750. The EMA of 10 is moving with bullish bias in the ascendant channel and it is below the EMA of 100 and above the EMA of 200. The RSI is falling towards the 50 level, the Stochastic is moving in high ranges, showing downward momentum and the MACD indicator is in the positive territory. The ADX is showing buy signal. We will remain bullish for this chart until the price reaches the 61.8 level of Fibonacci at 1.241.